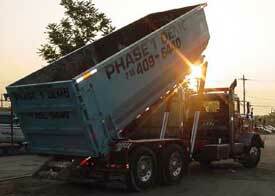 Phase 1 is a carting and removals company that has served the Tri-state area for over 25 years. We provide all types of carting and removal services to all types of clientele. Whether it's a homeowner, general contractor, building owner or a fortune 500 company, Phase 1 prides itself on providing top notch service at reasonable prices. All types of container service are available from 1/2 yard mini-containers to 30 yard roll-off boxes. Phase 1 has the equipment, experience and skilled personnel to get the project completed in a safe and professional manner every time.